I like the elegant lines, upper hull design and rigging on this Mediterranean Xebec by Tom Jacobs (Bonaparte). It doesn’t hurt that his picture title reminded me of a Camera Obscura song I get stuck in my head. Wow, that’s just amazing! Great design and details! As I said on Flickr, credits for this ship also go to my good friend Rick Bewier (Captain Green Hair) since this ship is an evolved version of his Xebec Telesell. 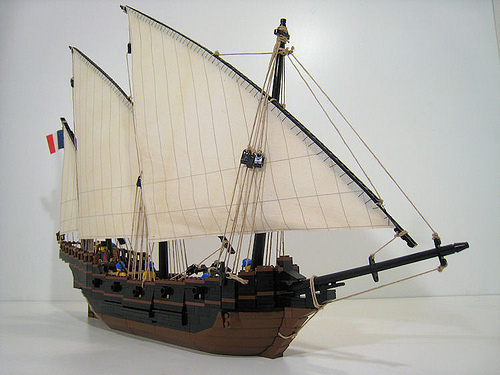 This is actually the most beautiful ship made with Lego I’ve seen so far. Great work on this.